« Is That Moose Crossing Sign For Real? For bicyclists, the Freeport area looks very tempting, with quiet back roads, rolling countryside, and ocean views. If you don’t mind some steep climbs, you’ll be rewarded with great views of Casco Bay and some of the wonderful islands and peninsulas of the Maine coast. 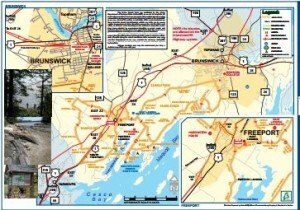 The State of Maine publishes bike touring information for many areas, including a bike tour of Freeport and Brunswick.Using that map (right) as a guide, you can enjoy rides ranging from 9 miles to 33 miles all around the area. The map is printable from the PDF file at the State’s website, or we have copies of the State’s book of Maine bicycle tour maps at Brewster House. If you feel energetic, you can do as one of our guests recently did (a word of warning – he competes in triathlons), and extend the route at the Brunswick end and go to Route 24, then out to Orrs Island and Bailey Island, then return via Mountain Road and Route 123, before coming back to Middle Bay Road, Mere Point Road, and Maquoit Road, and then returning as indicated on the map. According to our guest, that made the route about 65 miles, with some “really big hills”, but he enjoyed the ride – even the flat tire he got along Mountain Road. It may be an bicycling adventure that is not for the faint of heart, but it is an adventure all the same.